What’s that? No posts in two weeks, then two posts in one night? That’s right, kids went to bed early tonight! 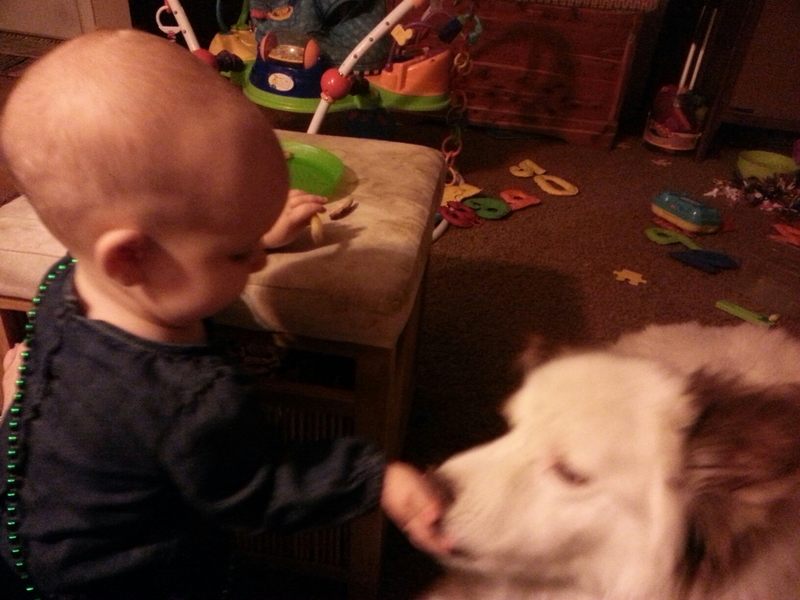 These pictures are from the very end of Grandpa Mitch’s visit and Rosalynn’s birthday. Eventually, I’ll get the pictures from the camera of Grandma and Grandpa Metcalf’s birthday, but don’t hold your breath. I don’t think these kids will go to bed early two nights in a row. Goodness gracious! It turns out, when I’m taking two classes, running a more-successful-than-expected t-shirt shop, and taking care of two increasingly-ornery kids keeps me from posting much on this poor blog! It’s been two weeks! Since most people have most likely given up on checking for updates, I won’t bother explaining much about the plethora of pictures that will follow. Kingsley has been going EVERYWHERE with us. This is half because Mitchell insists on bringing him, and half because Kingsley insists on coming. Between the two of them, I can’t win. Mitchell actually put Kingsley in the car the other day before we went somewhere (yes, opened the garage, opened the door of the car, and closed the car door). Only after Kingsley was safely already in the car did Mitchell come tell me that Kingsley was coming with us. Um, ok. Thank goodness he has a thick coat, because it’s COLD out here. Rosie has discovered books. Obviously, we’ve read to Rosie, and she certainly sees us reading to Mitchell all the time. But this last week she’s REALLY discovered books. Whenever nap time or bed time rolls around, we sit on Mitchell’s bed and read four books. Well, Rosie’s started crawling up on the bed with HER book when she realizes it’s that time. She then proceeds to throw a holy fit until we read HER book. And KEEP reading her book. Not Mitchell’s. Hers. All day, she grabs her favorite books (Curious George, Rachael Hale hand-me-downs from Mitchell, Brown Bear Brown Bear, and Hands are not for Hitting (I consider this favorite to be a passive-aggressive jab at her brother)), crawls into my lap, and hands the book to me. If I’m not sitting, she follows me around with the book fussing until I finally take the book and start reading. Thankfully, she doesn’t know the words of the books yet, so if I just have her book open and randomly turn the pages, I can still read Mitchell his book. Rosie has grown increasingly jealous. If Mitchell gets anywhere near my lap and she isn’t otherwise distracted, she starts fussing, then crying, then pushing him out of my lap. Thankfully, Mitchell has taken it pretty well and hasn’t pushed back. He also doesn’t move, so maybe that’s his push-back. It breaks my heart that she’s so jealous, but it also breaks my heart to think that Mitchell doesn’t feel welcome on my lap anymore. Finding a solution to this is an ongoing project. Rosie’s favorite thing was the ducks. Yeah, ducks. They had DUCKS at the Discovery Center! I guess she was giggling when Justin had her there (I was being held against my will at the salt water aquarium), and the moment I approached it with her she got a huge grin on her face. See if you can spot Daddy in that last picture. Can’t find him? Look for the giant gaping-I-mean-yawning mouth. Rosie was so tired, she conked out before we got home. Consider this a giant seal of approval for the Radio Flyer whatever-this-is. It was on my list for Mitchell for Christmas, but I didn’t think it was going to be this big, so I ended up not getting it. Then I saw it at a garage sale and brought it home. Holy cow, these kids LOVE it. 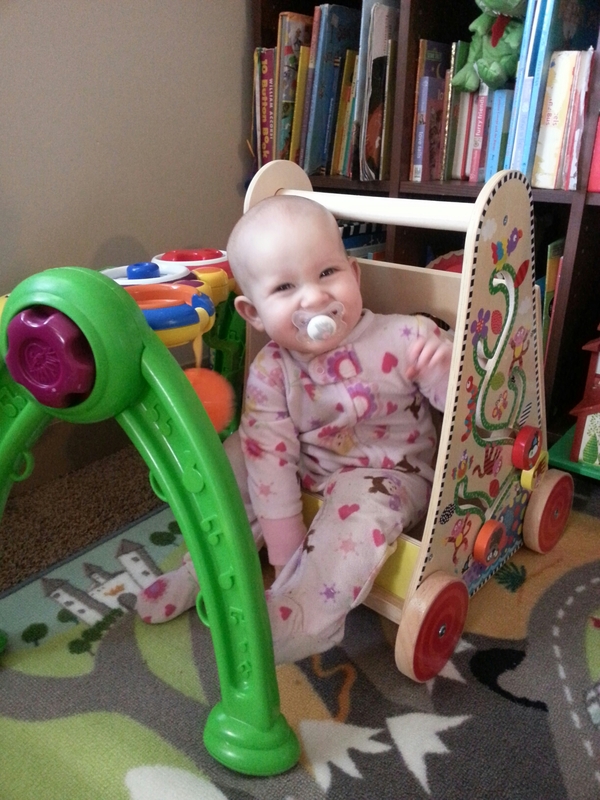 Mitchell loves pushing Rosie around in it, and Rosie loves just using it as a chair. Mitchell wheels himself around the house. So he’s managed to make even running around the house part of a sedentary lifestyle! He’s such a good ‘merican. Rosie had her 12 month check-up the other day. She thought it was hilarious to hide from the doctor. Since it was a shots appointment, I’m pretty sure she was saying “You can’t give me shots if you can’t find me!” After the doctor had done the check-up and verified that she’s fit as a fiddle (seriously, where did we get that expression? ), the doctor started discussing her size (itty bitty) and said, “Well, this might just be her growth pattern. I’m looking at you and thinking, this might just be genetics showing itself.” So yes, even Rosie’s doctor calls me short. After I got home I realized her height and weight percentiles totally don’t match, so I thought about calling back and saying “Wait, were you calling me short AND fat?” but I didn’t. I like her doctor. A year ago today, I went to the doctor’s office for my final appointment. I was given a list of options for my induction. I chose the earlier the better and reported to the hospital that evening at 7. A year out, the thing I remember most about this night is the loneliness. I know that’s a terribly memory to have of your labor, but I hadn’t planned on being alone the whole night. I hadn’t prepared myself emotionally for that. It felt like I was being dropped off to do the business of having a baby, and the rest of the family just wasn’t going to be involved in it. I cried a lot, and then felt guilty that I was crying while I should be joyfully anticipating the arrival of my baby girl, so I cried some more. There was a lot of crying going on that night. My poor nurse acted more as my therapist than my nurse. But I made it through the night. A year ago today, I was still in the hospital. Things were looking promising. Justin arrived, and we settled in to welcome our baby girl. We were so sure she would make her arrival that I still accidentally say “January 15th” when someone asks when her birthday is. Obviously, things did not go as planned, but, aside from feeling like a complete failure as the evening wore on, my memory of this day is still happy. Justin was there, plenty of people were talking to me online and with my phone, so I didn’t feel alone. I was also impressing the hell out of the doctors, so that helped. That evening we got the news that the baby was O.P. and it was very doubtful that I would be able to deliver her naturally. My nurse left me with a small glimmer of hope, so, a la Dumb and Dumber-style, I went “So you’re saying I have a chance!” and decided to keep going. I spent that night riding a roller coaster of emotions. The nurse kept turning me throughout the night, but the baby just kept turning back. My temperature spiked a couple times, but went back down with ibuprofen. Things kept looking brighter and brighter, only to turn bad again. But I persevered. I refused to give up. A year ago today, I began the day by pushing. I had made it through the night and it seemed that it was all going to be worth it. My little girl would make her appearance the natural way. Even pushing seemed to be so much harder than I’d ever dreamed. I would make so much progress, then she would just pop right back up. At one point, the doctor gave me the ultimatum: he would use the suction, and if that didn’t work, we would do a c-section. I buckled down with more ferocity than I ever thought myself capable of. The doctor was shocked when, by 11:00 a.m., without the help of suction, little Rosalynn Elizabeth Metcalf could be seen and, finally, she was out. When I gathered enough strength to push myself up and look at her, my first words were, “But she’s so tiny!” I couldn’t believe that this little tiny baby was what I’d been pushing out for 3.5 hours. The doctors and nurses laughed because she wasn’t all that tiny. Justin stayed with me until I was moved to a new room, then went home to nap and spend time with Mitchell. Until the grandparents came late that evening, it was just Rosalynn and me for the rest of the day. Not that she was named at that point. She was just Baby Girl Metcalf at that point, something that irked family, friends, and hospital staff to no end. I spent the day staring at my baby. I should have slept. If I’d known how that night would go, I would have slept. But instead I stared at her. She was beautiful. And she was mine. I felt such ownership of her. She was mine. I did this. I cried a bit, because nobody would see how beautiful she was, but mostly, I was thrilled. This was my daughter, for which I had dreamed. Even a year later, I can’t form the words to describe how perfect she was/is. Her arrival was not perfect, but nothing could change the love I felt just looking at her. Today is your birthday, my little Rosalynn. My beautiful, ornery, hilarious, happy baby girl. My Rose, my joy, my love. Our first few months were rough. I was terrified that you didn’t like me. I love you so, so much, and I expected to be able to soothe you just by holding you or nursing you. But that didn’t happen and I didn’t know why. I know now that it was simply a phase. You love me. Please, read this in 13 years and know that you loved me. And I loved you. We have spent this year fairly blissfully getting to know each other. I love every little bit I’ve learned about you. You’re ornery. My grandma (your great-grandma) always tells me that she can tell when I’m planning something, because I get a certain glint in my eye. I never understood until I met you. You’re a year old and I can already tell when you’re getting ready to be ornery, because your eyes crinkle up and you get a very noticeable sparkle in them. And, sure enough, it almost always turns out that you’ve stolen something from your brother or fed something to the dog. You’re a sharer. You share your toys, you share your food, you share everything. Even things I’d really rather you not share, like your saliva. You’re so, so loving. When your daddy gets home every evening, you run to him and give him a giant hug, like you haven’t seen him in weeks. You actually squeeze during your hugs. You pat backs. There have been many times this year that I’ve been upset about something and you’ve just come, given me a hug, and I feel immensely better. You have a magic quality about you, baby. I hope you utilize it to its full potential in the coming years. I just can’t tell you what a joy you are to be around. You’re my Little Bit, you’re my baby. I can’t imagine my days without you on my hip. I don’t know what the future has in store for us, love, but we’ll face it together. I promise. It’s Saturday, mid-morning. Other than a few treks to the kitchen for snacks, all four of us have been holed up in the warm master bedroom since we woke up, alternating between cuddling on the bed, jumping on the bed, and playing with the five thousand toys that always manage to get dragged down the hall into our room. It is a perfect morning. But I can’t shake this feeling of deja vu that has nothing to do with the fact that this is a fairly normal weekend morning for us. Finally, I realize: this is exactly the life I’ve always envisioned. Sure, some of the details are different (the state, for example), and I’ve been concentrating on those details, thinking my life has wildly detoured from its intended course. But THIS, this lazy morning, this bed, this is the main event. Those other factors, while certainly relevant, are merely details. I’ve always dreamed of my future. I had a very specific future in mind: a family that ENJOYED spending time together. Family dinners around the table, evenings spent reading countless books, and even lazy weekend mornings spent crowded onto the bed. And I have exactly that. It’s wonderful being me. And, so this isn’t entirely a wasted post, here are some pictures. Mitchell discovered that Kingsley can catch food mid-air, while Rosie discovered that Kingsley will eat from her fingers. I’ll be shocked if this dog gains less than 20 pounds this month. 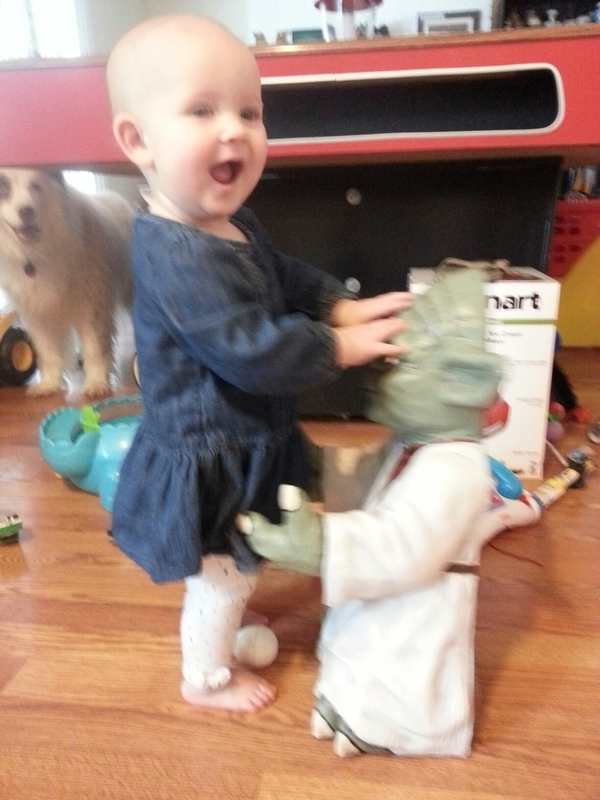 Meet Rosie’s new friend, Yoda. 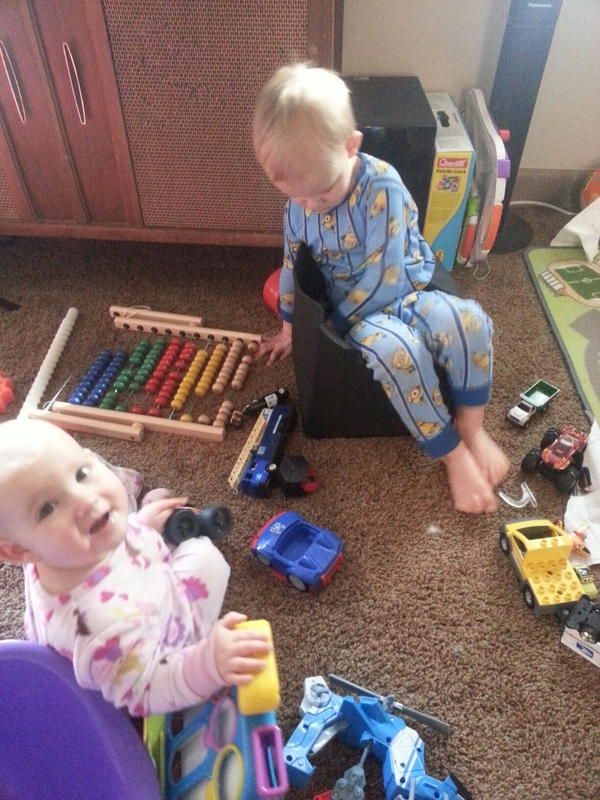 Mitchell doesn’t want to share his cars, and he figured out an ingenious solution to keep them from Rosie. I don’t know what Rosie’s purpose is here, but it’s adorable. Winter? Time for the pool! Winter finally found us in Ohio, so today we trekked over to the next town’s Rec Center. It’s HUGE and AWESOME and only $7 for a day pass. The pool alone is totally worth that! Grandpa didn’t have swim trunks and for some reason we couldn’t find any in stores, so we had a photographer for our fun. I can’t emphasize enough how much the kids loved it. We’ve never taken them before, but I doubt they let us go too long before our next trip! Rosie has decided she’s totally a grandpa’s girl. She hunts him down around the house and demands he carry her around. It’s nice to have a break, but I have to admit, I’m getting some jealousy pangs. Especially when she tried to hurdle the table yesterday at breakfast to get to him. So Grandpa’s now 2 for 2…both kids prefer him to Daddy or me.